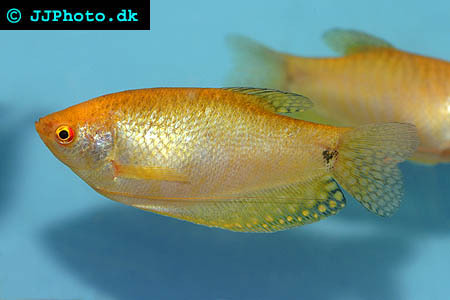 Company: Trichogaster trichopterus (Blue, gold, white gourami) is suitable for community aquariums. Aquarium setup: They will accept most living conditions but prefer a well planted aquarium tank with some floating plants on the surface. Avoid heavy circulation as this will prevent spawning. 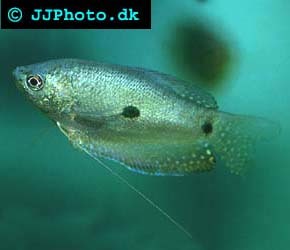 Blue, Gold and White Gourami are all color morphs of the same species. Feeding: They will accept latterly anything you can think about feeding them including oatmeal. Breeding: This species breeds willingly. They are bubble nest builders and the males build their nests among plants on the surface of the aquarium. Lowering the water levels and raising the temperature can help trigger spawning. The male guards the nest and the eggs and fry in it.